It is lovely when old acquaintances pop back into life unexpectedly. I took a little tour through our pal Karena's blog, Art by Karena. She always does fun giveaways, and she has a great one going on now. Not only are the items she chooses fabulous, but she has a knack for getting readers to submit intriguing comments. As I read through her post on Francine Gardner, my memory wandered to visits to an excellent shop in New York City, Interieurs. No matter where Francine is working, what she does is lovely and soulful. But wait! It gets better! Karena's giveaway is of a lamp by Jose Esteves. I kept looking at the pictures of his work, thinking, I know him, I've seen this work...and it came back to me, a shoot on a moody Paris afternoon, with my pal (and foodie extraordinaire) Lora Zarubin--my friend Judy has been cooking her way through her excellent book this summer, I Am Almost Always Hungry. We were at the fabulous apartment Jose was sharing with his partner, Monique, herself a wildly creative person. Chandeliers made of spoons were tinkling in a soft breeze overhead. Jose is a talented designer; his vision is unique, playful and elegant at the same time, no small feat. 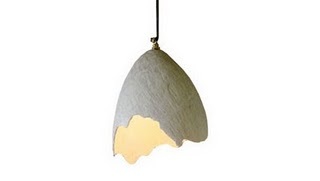 Naturally I'm entranced by the eggshell lamp...Check out the gang at Art by Karena, and go for that handsome lamp she is featuring! Excellent fun on a grey day, at least here in Rhode Island.